WTOP's Rob Woodfork says that by dragging their feet, the Baltimore Ravens have removed any question that Colin Kaepernick is being blackballed by the NFL. WASHINGTON — As if the curious case of Colin Kaepernick wasn’t frustrating enough, here come the Baltimore Ravens. 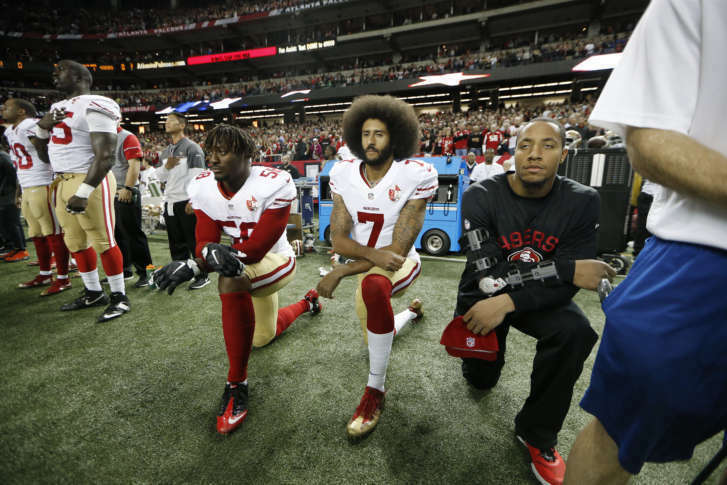 As you surely know by now, the free agent quarterback is currently the NFL’s most polarizing figure because of his silent resistance (I don’t like to use the word protest in this context) during the 2016 season. You’ve probably also heard by now the starting QB he lost to in Super Bowl XLVII, Joe Flacco, is dealing with a back injury that has cost him at least the start of training camp. If we’re simply talking about football, Kaepernick-to-Baltimore makes all the sense in the world. Kaepernick’s offensive coordinator during the 49ers Super Bowl run five years ago (Greg Roman) is on the Ravens staff now. Head coach John Harbaugh’s little brother Jim has given a good appraisal of Kaepernick, which should carry weight since he had a hand in developing Kaepernick to those championship heights five years ago. Plus, the Ravens current situation is way less than ideal. Behind Flacco — who himself has struggled in recent years — is Ryan Mallet (an unmitigated disaster so far), Dustin Vaughan (who?) and Josh Woodrum (a journeyman scrub). Baltimore even had the gall to consider kicking the tires on Robert Griffin III (who is nothing more than a leverage tool in trades and has more baggage than a Kardashian on moving day). That’s a depth chart that screams for a guy like Kaepernick, easily the best available QB on the free agent market. His touchdown-to-interception ratio (72-to-30) since 2011 ranks ninth-best in the NFL. Only Cam Newton and Russell Wilson have more than Kaepernick’s 2,300 rushing yards among quarterbacks over the last six seasons. Last year, he posted a 90.7 QB rating on a lousy team that unsuccessfully tried to phase him out. This notion that Kaepernick can’t get a job because he can’t play anymore is a wrongheaded insult. So that means, Kaepernick really can’t get a gig because of his silent resistance last year, a fact Giants owner John Mara (whose father Wellington had no such reservations about employing Lawrence Taylor) and Ravens owner Steve Bisciotti have openly admitted. While I applaud the honesty, this admission is especially hypocritical because, if Baltimore believes signing Kaepernick is a gray area, the Ravens organization has long demonstrated a willingness to live in a deep charcoal gray. Ray Lewis (who clearly still believes that talking nonsense passionately makes him seem intelligent) was guilty of obstructing justice for a double homicide before he was a Super Bowl MVP. Ray Rice TKO’d his future wife on video. Both players initially got the benefit of the doubt from the Ravens and damn sure weren’t the subject of some foolish fan poll. But remember Donte Stallworth? The Ravens signed him just eight days after he was reinstated from a one-year suspension for a drunken driving manslaughter conviction. I don’t know about you, but my moral compass says that’s a significantly worse look for Baltimore’s brand than signing a guy whose worst crime is taking a knee during a war hymn at a sporting event. Furthermore, any circus atmosphere surrounding Kaepernick is completely media created. He never announced he was going to sit during the national anthem — a reporter noticed it last year and asked him about it. While Kaepernick has yet to get in front of a camera and speak this offseason, he reportedly has no plans to protest or resist during the 2017 season. The cruel irony in this situation is NFL owners are, in the same breath, making a decision that has nothing to do with football and saying they don’t want Kaepernick because he’s not all about football. There have been reports he’s lost weight and isn’t in football shape, along with allegations that he’s only using football as a platform for his social advocacy. I guarantee you those whispers are coming from NFL front offices seeking to justify their refusal to even give Kaepernick a workout to see for themselves. Here’s the bottom line: NFL owners are saying loud and clear they prefer to have mediocre white QBs praising Jesus and pitching products than a good black QB with an afro asking the country to pay attention to the plight of people of color. That’s the only logical explanation for why Tim Tebow can land multiple backup jobs despite attracting the same “media circus” teams seem so desperate to avoid with Kaepernick even though he’s clearly still relatively popular. As we approach the 30th anniversary of Doug Williams becoming the first black QB to win a Super Bowl, this much is apparent: The NFL — and the United States as a whole — still has a long way to go in the racial equality department.